If you don’t like thigh meat you can use white meat. I personally like the sweet juicy taste of the thigh meat. Season chicken with salt and pepper. Heat 1 TBSP oil in a large skillet over med heat until simmering. Add half the chicken and cook until browned on both sides. Repeat until all chicken is browned. Transfer to 5 Qt slow cooker. To the same skillet add the onions and cook until tender and golden brown. Add brandy and stir occasionally to loosen particles from bottom of skillet and liquid is almost evaporated. Add the onions to the slow cooker. Whisk together the honey, mustard and chicken stock. 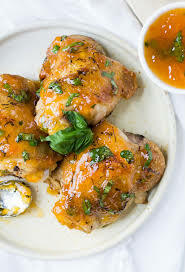 Pour over onions and chickens in the slow cooker, cover and cook on low for 4 hours or until chicken is tender, add the apricots about two hours into the cooking process. Remove chicken pcs to a plate and pour juices from the crock pot through a strainer into a small saucepan. Bring juice to a boil over med heat; reduce and simmer until sauce is reduced to about 3/4 C. Whisk in cold butter and serve sauce with chicken. OPTION: Garnish with fresh sliced green onions or a few sprigs of thyme or oregano, maybe a basil leaf or two. Remember to make your food look pretty and it will taste even better! !